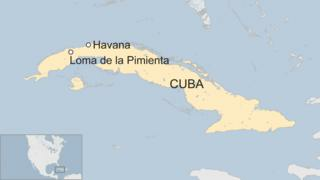 A military plane has crashed in the mountainous west of Cuba, killing all eight personnel on board. A military statement said the twin-engine turboprop Antonov AN-26 had crashed in the province of Artemisa on a flight from Playa Baracoa, just outside the capital Havana. The cause of the crash is unclear and an investigation has been launched. The site of the accident was said to be the Loma de la Pimienta mountain about 80km (50 miles) west of Havana. "The eight military personnel on board, including the crew, died," the armed forces ministry said in a statement. "A commission of the Ministry of the Revolutionary Armed Forces is investigating the causes of the accident." Cuba&apos;s last major plane crash was in 2010 when an Aero Caribbean flight went down in flames killing all 68 people on board.